Anybody that is reading this blog for a while knows by now that I am an advocate of artificial lures, spoons and of course Rapala lures. I dislike the mess natural bait makes and the attention natural lure and bait needs. But I also believe, based on my experience, that in many cases artificial lures, spoons and such are far superior for catching fish. Of course not all artificial lures are equal, much of what works depends what the fish prefer. 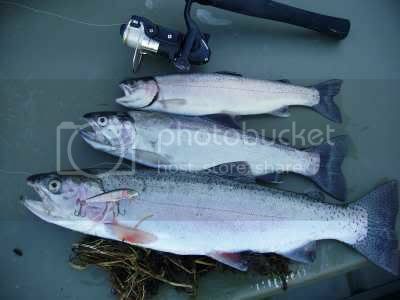 Around here fishers bet on weeding bands, silver spoons and rooster tails to catch rainbows. No matter who you ask, even the pros, will tell you that you must use one of the above if it’s rainbows you want to hook. Not one to ignore advice of local fishers I tried different colors of wedding bands on Sunday on the Nicola Lake. After a half hour I still waited for action. Then I changed to different spoons and finally tried rooster tails and still nothing. That is about the time where most fishers would give up and go home. But not me. The previous day I hunted waterfowl on that lake and it was cold. So cold that there was a thin layer of ice on the water surface along the shoreline. Rainbows get hungry as soon as the temperature drops and judging on the jumping fish everywhere on the lake, they where very hungry. Instead of going home I gave it one more try with my secret weapon. The Rapala lure. Remembering well that Rapala’s saved the day when I took my wife Heidi on her first fishing trip. For the first ten minutes I had no action and I assumed it was because the only Rapala lure I had on me was not a deep diver. I quickly remedied that by adding a small lead sinker to the line. 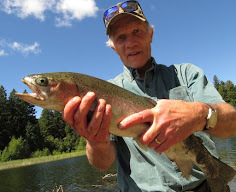 Within five minutes of making this small adjustment to get the lure deeper under the water surface I had the first bite, a nice medium sized rainbow. On the second cast I had another bite the moment the lure hit the water surface but I lost the fish. On the third cast I reeled another trout in and on the fourth cast I hooked an absolute monster rainbow. It might very well be the biggest rainbow I ever caught. This one put up a very good fight and at times I worried that the monster could breake the line. It took me over ten minutes to land that giant rainbow. 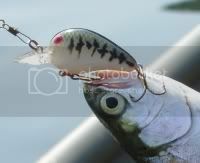 The fish was so eager to take the Rapala that it swallowed the lure all the way down with the two treble hooks. At home I measured the monster at exactly one and half foot long and it weighed cleaned out still just a hair under four pounds. Once again the Rapala did what I was expecting it do where every other lure failed. I have been using Rapala lures for many years and I am continually amazed how well they work on most fish species. Sure I use other lures too but the Rapala remains my secret weapon in the fishing tackle box. Wow those are nice fish. Looks like you had a good day, and you'll have a nice meal or two. Excellent fish there my friend! You know you don't have to sell me on using Rapala lures. I am really fairly narrow minded about them. They have taken good numbers of fish for me and good sized ones also. Hope you continue to have some good fall fishing when you have a chance to get on the water. Ah, I thought of Mel when I read this and see he's already been by and left his comment! You guys just might convince me to switch from being a Blue Fox spinner guy to a Rapala guy! What a dandy of a trout, Othmar. Beautiful! Kristine – In retrospect I should have taken a picture of the big rainbow with me. As it turns out, from what I heard, this is the biggest ever pulled out of that lake. I love rainbows they make very tasty table fare. Mel – I know about your narrow mindedness. (lol) Mind you if a lure works that well it is easy to get narrow minded about it. Tom – Blue Fox is a good lure too that accounted for many of my fish. But there are often times when a lifelike lure, like the Rapala are the ticket. I found it always a good tactic to have as many different lures in the tackle box as possible. I've two questions: The Rapala lures have two treble barbed hooks on them. 2) Can you use both of the hooks or do you have to remove one of them? (page 9 seems to suggest that "angling" means only one hook, but then there's the word "OR" in the definition. 3) If you have to remove one of the two treble hooks, would you remove the middle one or the tail one? Rand - According to updated regulations for 2009 2010 you only can use on treble hock on a lure. I have removed the tail hook and seems to work fine. Most predatory fish attack prey head on. Yes you only can use barbed hooks on lakes here in BC. Just take a pair of pliers and bend the barbs down onto the body of the hook.